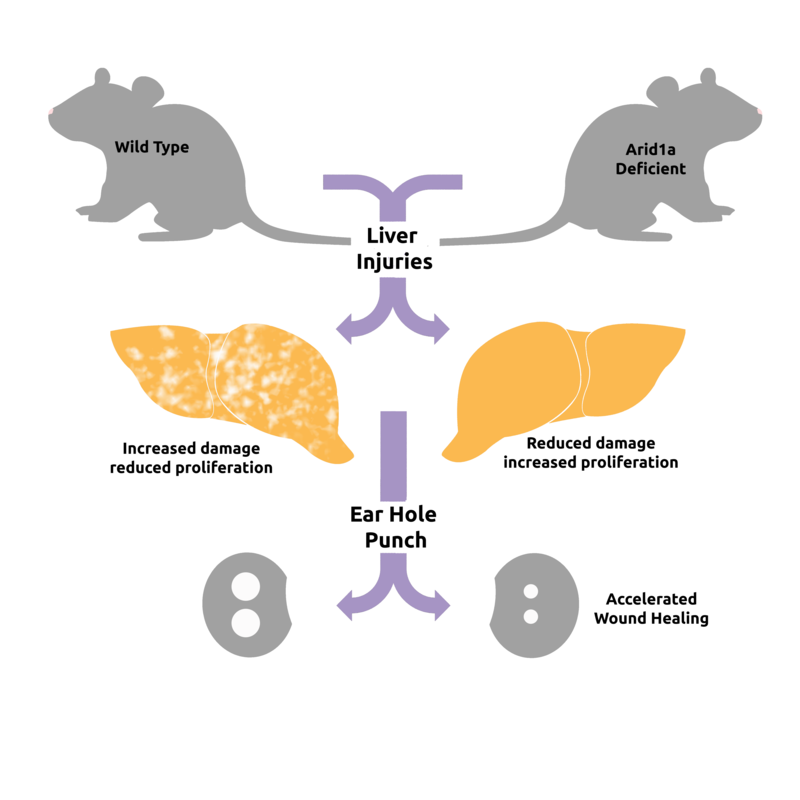 March 25, 2016 – Scientists at the Children’s Medical Center Research Institute at UT Southwestern (CRI) report that inactivating a certain protein-coding gene promotes liver tissue regeneration in mammals. 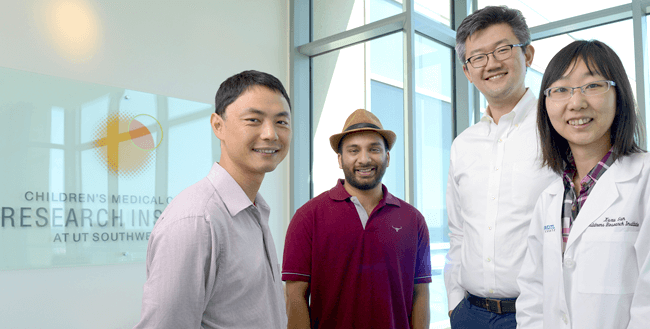 “This research gives us ideas about new ways to treat liver damage or chronic liver disease,” said senior author Dr. Hao Zhu, an Assistant Professor at CRI with joint appointments in Internal Medicine and Pediatrics at UT Southwestern Medical Center. The study was published this week in the journal Cell Stem Cell. Tails in lizards and arms in starfish show an astounding ability to regrow, but mammals have partially lost the capacity to extensively regenerate body parts, Dr. Zhu said. The liver is unique among human solid organs in its robust regenerative capability. A healthy liver can regenerate up to 70 percent of its tissue after injury, he explained. However, when the liver has been repeatedly damaged – by chemical toxins or chronic disease – it loses its ability to regenerate. Following repeated injuries, cirrhosis or scar tissue forms, greatly increasing the risk of cancer, said Dr. Zhu, who also treats liver cancer patients at Parkland Memorial Hospital. The Zhu laboratory studies both regeneration, when cells proliferate to repair an organ, and cancer, when cells proliferate out of control. “We want to identify small molecules that mimic the effect of these genetic findings. The ideal drug would be one that helps the liver heal while inhibiting the development of cancer. That would be the perfect drug for my patients,” said Dr. Zhu, a CPRIT Scholar in Cancer Research. Dr. Zhu said loss of the gene and the protein it expresses may accelerate regeneration by reorganizing how genes are packaged in the genome so that the cells can more easily switch back and forth toward a more regenerative state, sort of like a toggle switch. Co-authors included lead author Dr. Xuxu Sun and Dr. Xin Liu, postdoctoral researchers at CRI; Dr. Jen-Chieh Chuang, Assistant Instructor at CRI; Mahsa Sorouri, research assistant at CRI; Lin Li, senior research scientist at CRI; Dr. Jian Xu, Assistant Professor at CRI and Pediatrics at UTSW; graduate students Cemre Celen, Shuyuan Zhang, and Yi-Chun Kuo; Liem Nguyen, a Howard Hughes Medical Institute International Student Research fellow; Dr. Sam Wang, Assistant Professor of Surgery at UTSW; Dr. Ibrahim Nassour, surgical resident at UTSW; Thomas Maples, medical student at UTSW; Mohammed Kanchwala, a computational biologist in UTSW’s Eugene McDermott Center for Human Growth and Development, and Dr. Chao Xing, Associate Professor in the McDermott Center and of Clinical Sciences. Other contributors were from First Affiliated Hospital of Sun Yat-Sen University, UT Southwestern’s sister institution in Guangzhou, China; the University of California, San Diego; Icahn School of Medicine at Mount Sinai; and the University of Michigan. This study was supported by the American Heart Association, the March of Dimes Foundation, the National Institutes of Health, the Burroughs Welcome Fund, CPRIT, and donors to the Children’s Medical Center Foundation.